Beds in solid beechwood. The ideal solution to optimize space and meet three needs: relax, study and night. They combine function and design in a game of simple and elegant lines. The beds are available with ladders or cube stairs. All beds and accessories from the KU-BE loft bed series. This serie is very functional and solid for the most durable loft beds. The stairs and the accessories complete the loft bed to increase functionalities. All beds and accessories from the Ultra Reverse series. These loft beds are made up of solid beech wood, with a resistant and elegant frame in a very particular shape. You can use various accessories of the bed to create also a study or relaxing area. KU-BE loft bed is made up of solid beech wood, has a simple and basic frame but at the same time is resistant and elegant. It is the ideal solution to better use the space in your room without sacrificing design. You can use various accessories of the bed to create also a study or relaxing area. Slats and tatamis are included in the price. Ultra Reverse loft bed is made up of solid beech wood, has a resistant and elegant frame, with a very particular shape. You can use various accessories of the bed to create also a study or relaxing area. Slats and tatamis are included in the price. 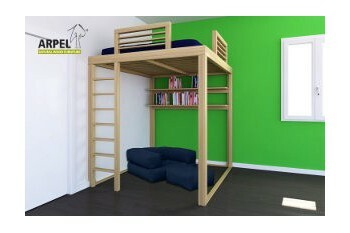 KU-BE loft bed with ladder is ideal for those who have limited space in their room. The resistant ladder made up of solid beech wood is embedded within the frame. You can use various accessories of the bed to create also a study or relaxing area. Slats and tatamis are included in the price. Ultra Reverse loft bed with ladder is ideal for those who have limited space in their room. The resistant ladder made up of solid beech wood is embedded within the frame. You can use various accessories of the bed to create also a study or relaxing area. Slats and tatamis are included in the price. The loft bed and stair KU-BE are the perfect pairing. In addition to the bed base, you will also have a cube bookcase which can be equipped with drawers and handrail. You can use various accessories to create also a study or relaxing area. Slats and tatamis are included in the price. The loft bed and bicoloured cube stair Ultra Reverse are the perfect pairing. In addition to the bed base, you will also have a cube bookcase which can be equipped with drawers and handrail. You can use various accessories to create also a study or relaxing area. Slats and tatamis are included in the price.